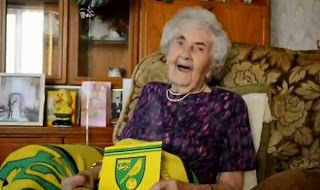 Grandma Vera Norwich follows since the 20-ies of the last century, and on the matches she went to the 1989th when she filled 76 years. Since then all matches follows from her home. "On my birthday we all gathered and watched the match. Would be nice if we had won, but at least we played well. We deserved at least a point, but the United triumphed. Life goes on," said Vera. Vera is a "title" officially oldest fan on the planet took in April 2013th after the death of Maria Radaelli, known as Granny Inter. Maria died the day before his 114th birthday.